In our blog we have already described in detail how to clean and protect your tunnels and plugs. With breathable ear tunnels it will be still necessary to clean your tunnels and your ear lobe piercing regularly. But they make tunnel hygiene much easier and you need to do it less frequently. The reason why flesh tunnels and plugs tend to smell if you don´t clean them regularly is because the skin permanently oozes sebum and sweat. If you don´t remove this by cleaning your tunnel jewelry and your ear lobe piercings it might stink after a while. Our new breathable ear tunnels solve this problem everybody who wears tunnels has. At the place where they have contact to your earlobe piercing they are perforated. Because of these small holes your skin can breath much better. Because the skin can breath much better if your wear breathable flesh tunnels with small holes in it the discharge of sweat and sebum will be reduced enormously. Of course you still need to clean your ear tunnels anyway. But the time range until your tunnels might beginn to smell is extended enormously if you wear breathable ear tunnels. When you wear classic ear tunnels or plugs your jewelry might smell after 2-3 days. With our breathable ear tunnels this time period will be extended up to 4 weeks. This definitely is an enormous improvement. But nevertheless we recommend you to clean your your ear tunnels and flesh plugs on a daily basis. But when you are abroad for a long term trip or if you are visiting a festival you will always be safe and your new potential heartthrob will not remember you as "the person with the smelly tunnels". Perforated flesh plugs and tunnels - not only helpful against sweat and sebum but also lightweight. 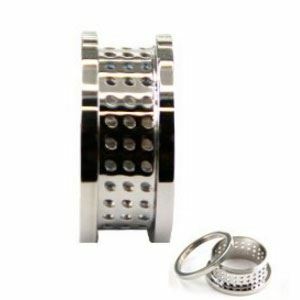 Because of the many small holes in the breathable tunnel jewelry it is very lightweight in comparison to classic ear tunnels in the same size. They are barely appreciable and offer an enormously high wearing comfort. Especially with the steel tunnels which can be quite heavy in the higher diameters breathable tunnels will be an enormous improvement in comparison to classic ear tunnels. The breathable ear tunnels are particularly interesting for people who wear big flesh tunnels. The wearing comfort is even further increased because the secretion of sweat and sebum is reduced noticeable and so there will be no itching, too. Also because of this fact the breathable tunnels offer a high wearing comfort. You can say the breathable ear tunnels are a re-design of the classic ear tunnels. Although the breathable tunnels let your skin breath much better the newly developed flesh tunnels are as robust as ordinary flesh tunnels. Leading engineers have developed a highly innovative ear tunnel solution made of valuable ultra hard and scratch resistant 316L surgical steel. But the breathable tunnels with gemmed ring are at least the same way robust. The strass is protected by a scratch resistant sealing.